Want a beautiful essential oil diffuser necklace without the high price? 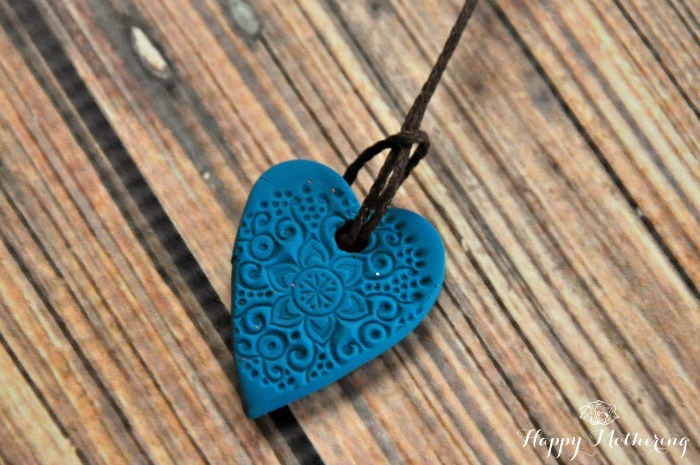 This DIY Baked Clay Diffuser Necklace is so easy to make with a few supplies. Wearing an essential oil diffuser necklace is one of my favorite ways to enjoy essential oils. Ever since I was introduced to essential oils, I have fallen deeper and deeper in love with them. I love how they can support my family’s health, balance moods and so much more! 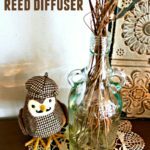 I love running my essential oil diffusers all the time, but when I’m on the go I don’t have that option. To get the therapeutic benefits of essential oils on the go, the girls and I decided to make essential oil diffuser necklaces. If you don’t want to make them, you can also buy a diffuser necklace, but it’s not as much fun as making them. So we made a plan and gathered our supplies. Once we had all of the supplies for our essential oil diffuser necklaces, they were so easy to make them! We spent an afternoon making them and we have a huge selection now. It was a really fun project to do with the kids. We had so much fun that I forgot to take pictures of the process, but it’s pretty self explanatory. Next time we’ll be making air dried terracotta essential oils diffuser necklaces! But these ones were great because we could choose colors and they were ready for use very quickly. Remove the clay from the package, and roll it out using a rolling pin until it’s around 1/4″ thick. Cut shapes out of the clay with the cookie cutters, just like you would when baking cookies. 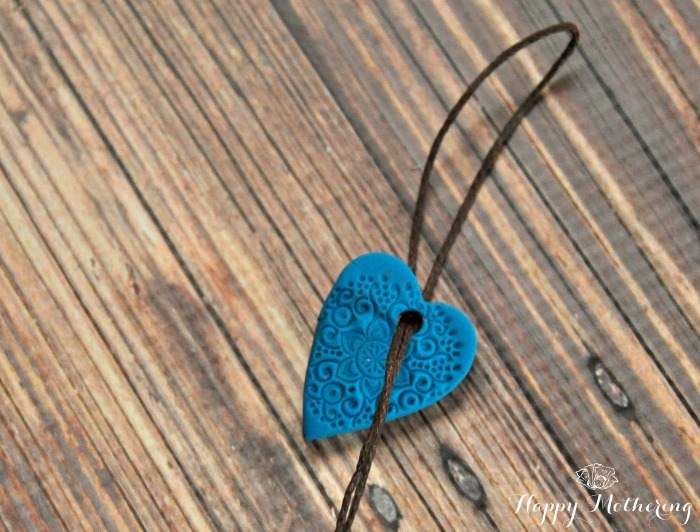 Stamp a pattern onto the pendant, then use the straw to make a hole where the pendant will be tied to the string. Transfer the pendant to the parchment paper lined cookie sheet, then repeat until you’ve made all of your clay pendants. Bake the pendants according to the package directions and allow to cool completely. 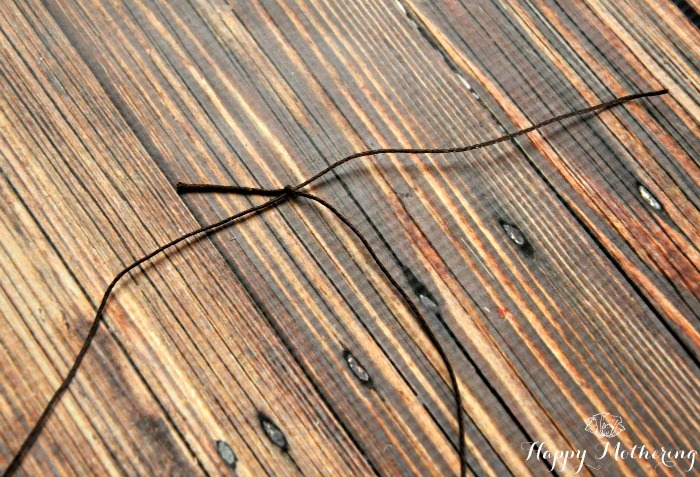 Once they’re cool, cut a piece of twine to your desired length – go a little longer than you think you want because I’ll show you how to make them adjustable. 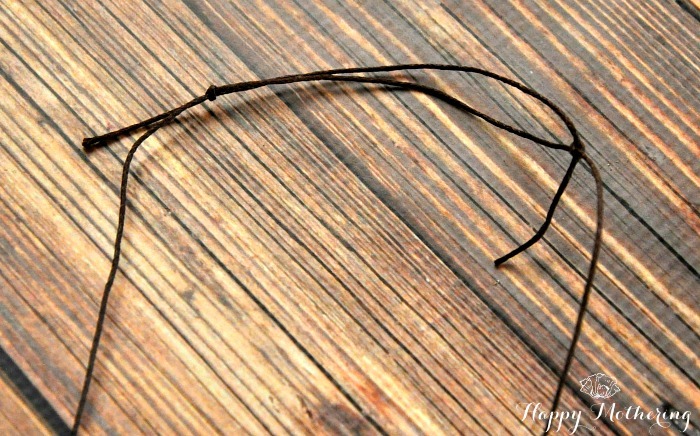 Fold the twine in half, then insert the loop through the hole on the pendant. Take the other end and stick it through the loop. Next, take one end of the string and tie it to the other end. You should be able to move the knot up and down the string it’s tied to. Then, tie the other end to the other string, again making sure you tie it so the knot will move up and down.To adjust, all you have to do is move the knots up or down to make the necklace larger or smaller. To use as an essential oil diffuser necklace, just apply 1-2 drops of your favorite essential oil directly to the clay and lightly rub in. It should last for at least a few hours as long as you’re using a quality essential oil. I love using scents that give me a nice, ongoing mood boost throughout the day. Look how cute they look on Kaylee! What is your favorite essential oil to use aromatically? Wow! I love coming across totally new ideas, and I have never seen anything like this before.These are so cute and such a creative way to diffuse oils on the go. I love it!! My dear, you are a genius ! We use to put oils for different deseases on cotton disks, in pockets. But your idea…is gorgeous ! Thank you ! That blue heart is incredibly beautiful! Does the oven bake take the oil as well as the air dry clay? These ones will hold the scent for several hours. I’m been want to try and make some necklace diffusers ever since my daughter got me buying essential oils. I just wasn’t sure what type of clay. Thanks for the tutorial. Great idea to add the scents to the necklace. They turned out cute! I love this idea! I know you can purchase the clay diffusers, but from what I’ve seen, a number of them are a bit expensive for what they actually are. Going this route, you can make them for yourself at a fraction of the cost. They’d also make a great gift with a bottle or two of essential oils. Thanks for the idea! Pinning! What a great idea! They are so pretty! Very clever! Thanks so much for linking this up at Best of the Weekend! These are so pretty! Thank you for sharing them on Show Me Saturday! 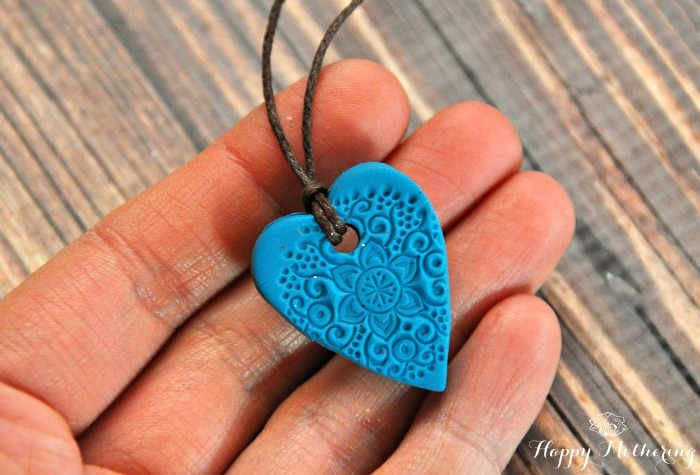 I have seen other versions of clay necklaces, but yours if really beautiful! I have created DIY pendants for diffusing EO but using these awesome stamps made the pieces so beautiful. I loved it and will try some at home soon. This has inspired me to make some clay diffuser necklaces. I bought all the items you suggested and they look good, however they didn’t get hard. They bend, therefore the oils aren’t absorbing into the clay. Any suggestions? When you cooked them did you just cook them on the parchment paper and cookie sheet? Hi Samantha, yes we just baked them on a cookie sheet and parchment paper. If they are still soft, they probably need to be baked for a bit longer. I always have to bake things for longer than normal because we live at altitude. Totally love it! I dont know can i make this, bcoz im not good at crafting 🙁 but i still gonna try. Quite a while back I stopped using anything with the ubiquitous & never-defined ingredient “fragrance”. I don’t miss the exposure to the fake stuff, but I definitely miss wearing perfume. As such, I’m wondering if these clay necklace diffusers could be used as substitutes for perfume/cologne? I mean, how cool would it be to combine two of my favorite ‘make me feel pretty’ things: jewelry and perfume?!?! Anyway, if you could share some links/tips for creating “perfume” from EO’s, that would be super!! (Assuming, of course, it’s even plausible to use EO’s in that manner.) Then I might build on your project and try earrings too. Woo hoo!! Hi! I use high quality oils and they break down petrochemicals because they are toxins. I would think that the essential oils would break down the polymer clay, since it’s a petroleum product. Just wondering how the pendants are holding up. I have used polymer clay for years and breakdown was my first concern. We can’t even store in certain plastic containers because it starts to eat that particular plastic. Or use certain sealants ! Second is once the oils start eating the polymers in the clay what toxins are being released into our skin? I’m not wanting to come against this, but knowing plastics and chemicals and reactions would like to protect people. Even though they have “held up” doesn’t mean this is a safe idea! Essentials oils, specially therapeutic grade are powerful! Such a wonderful idea! I have many small oil diffusers that I can bring them to anywhere I want. But these oil diffuser necklaces are far far better than that! Plus, they looks extremely beautiful. This idea is so impressive, I totally love it! Thank you so much for sharing! My final product just will not absolve the oils, what might gave gone wrong? Not baked long enough? Wrong brand? I use Fimo effects coz that is what available for in my country! I think polymer clay just doesn’t do as well as air clay for this project, I do love the ability to stamp though and the colors of the polymer. I think what I’m going to do is use my sculpy, stamp then add lava stone and put the EOs on the stone. can you use the same beads/necklace and change out the different oils each day or should there be a necklace dedicated to only one oil? cant wait to make some of these! What did you charge the ladies per necklace making, since you purchased all the craft items. I bet these would work really well in the car hanging from the mirror to help keep the car smelling nice. Yes, they work great for that too! I love these because they are so pretty. I made them with my girls. However, the clay will not absorb the oils? They are too hard. Any suggestions? Hmm, that’s interesting. The oils will appear to sit on top of ours at first, but do absorb in because the smell lasts for a couple days. Did you use a different type of clay? Do you mix the paint with the clay before making your pendant or do you paint afterwards? Do you have to use special paint for the oil to be absorbed into the pendant? Hi. I love the pendants! I’m new to making diffuser necklaces and have been doing quite some reading and researching on which clay is best to use. The clay you suggested and which I ended up buying is polymer and contains a basis of PVC resin and a liquid plasticizer. This means that the end result after it’s baked contains plastic. And isn’t it true that essential oils break down plastic over a period of time? I love this brand and clay for its multitude of colors to choose from, but I think it isn’t ideal. What do you think? Also, others have suggested using a natural clay such as terra cotta because it won’t be “broken down” by essential oils. Thoughts?? I work with polymer clay making fairy doors and sculptures and I thought the same thing. I am going to try it but since they are a plastic base I also don’t understand how they can absorb the oil, wouldn’t it just linger on the outside of the pendent? 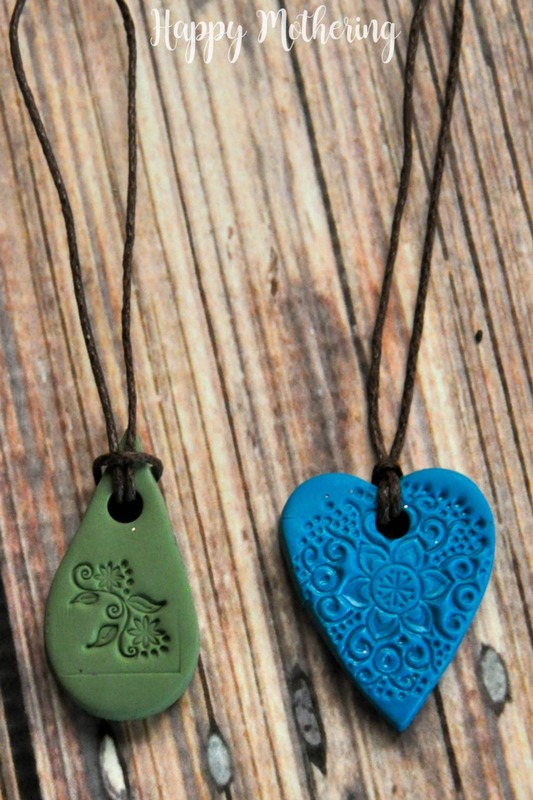 I just made a few necklaces but used a different type of clay – terra-cotta clay that is air dried. it holds the scent well, but I accidentally dropped the necklace on the floor and it chipped. Wondering how the clay you used holds up? Thanks for the tutorial and the links to the items you used. Of clay, has anyone determines the best one to use that comes in nice colors?